A few nights ago I was in one of those moods when I didn’t feel like eating what was on my meal plan and while gazing into the fridge for inspiration, I noticed a number of eggs that were begging to be used. Now there can be very few cooked meals that are quicker, or should I say easier to prepare than this delicious savoury tart. No pastry to make or defrost, you literally add all ingredients to the flan dish and bake for 35 minutes, although I prefer to fry a few of them together first. It is also very versatile, so depending on the items you have in the fridge at the time, you could eat one of these a week and they might never be the same twice. You are limited only by your imagination, and it is amazing what ingredients work really well together in the form of a quiche. Served with a fresh garden salad, it ticks all the health blocks too :). 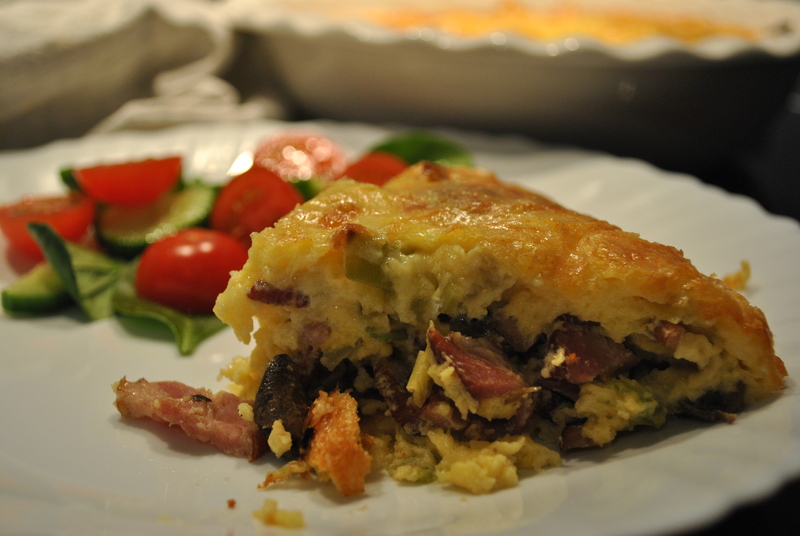 This recipe can be halved for a smaller size quiche, but as a main meal, I like it big and full of delicious ingredients. Preheat your oven to 180°C and grease a small pie/flan dish or spray it lightly with oil. Gently fry the leek, bacon and mushrooms for a few minutes until tender. Remove from the pan and add to the pie/flan dish. Combine the milk/cream, eggs, flour and mustard together and pour over the ingredients in the pie/flan dish. Sprinkle with the salt and pepper and cover with the cheese.